Much to the chagrin of anyone who believes that guitars equal real music, the artificial divisions that once kept pop and rock acts in separate corners have collapsed through gradual erosion. Music genres have been so thoroughly blurred together and amalgamated that calling something “pop” or “rock” today is almost as meaningless as hauling out the beleaguered “indie.” Perhaps the quintessential example of this sonic modernity is HAIM, a trio of sisters—guitarist-vocalist Danielle, bassist-vocalist Este, and guitarist-keyboardist-vocalist Alana Haim—who are exuberant fans of music, period. The band’s approach incorporates elements of ’80s Fleetwood Mac, electro-tinged rock, and a thoroughly ’90s version of pop, hip-hop, and R&B. The sisters are as inspired by TRL choreography as they are their parents’ record collection. 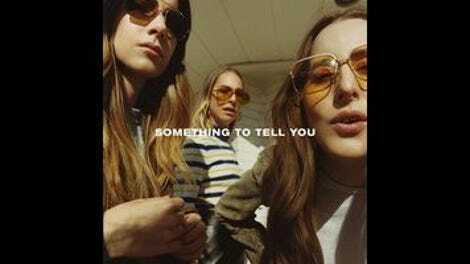 HAIM’s Something To Tell You reflects that fierce love for the music that moves them, no matter what form it takes. The trio’s frequent, three-part harmony bursts often conjure Wilson Phillips’ sun-soaked vocals—nowhere more than on the meditative title track—while the ’80s soft rock gem “You Never Knew” overflows with glittering synths and velvety production. Standout “Walking Away” is even better, a breathy R&B jam with a subtle funk underbelly and elaborately braided vocal harmonies. Overall, however, Something To Tell You is less of a retro pastiche than HAIM’s 2013 full-length debut, Days Are Gone. (The notable exception is “Nothing’s Wrong,” most of which is such a dead ringer for a Christine McVie-penned song that it’s shocking she’s not actually on the track.) Many of its touch points feel more contemporary: There are subtle nods to The 1975’s shapeshifting (the gulping rhythmic funk of “Ready For You”), and “Nothing’s Wrong” makes room for a Dirty Projectors-esque interlude. Highlight “Found It In Silence”—which features stair-step string embellishments by Owen Pallett, Serena McKinney, and Mike Olsen—feels timelessly majestic. Despite such ornate detailing, the record’s music doesn’t sound as fussed-over as previous HAIM releases, where the band’s perfectionist tendencies have tended to overwhelm. Producer and sometimes co-writer Ariel Rechtshaid, along with a select few collaborators (including Rostam Batmanglij, Twin Shadow’s George Lewis Jr., and Blood Orange’s Dev Hynes), aid and abet this nimbleness, which allows for plenty of memorable musical turns. The band does a sudden harmonic breakdown on the phrase “for you” on “Ready For You,” which underscores the song’s generous emotional spirit, while Danielle subtly plays a glass bottle for percussion as “Walking Away” unfolds. Going through the emotional wringer and learning hard-fought personal lessons has helped the members of HAIM discover what they want, resulting in a palpable, inspiring confidence. “I found it in silence, finally see / There’s no turning back / I know what’s good for me,” asserts “Found It In Silence.” There’s a refreshing lack of cynicism throughout; the band’s lyrics are matter-of-fact about previous hardships and optimistic that the future will be better. “Little Of Your Love” is about starting over with someone new and embracing vulnerability, while “Ready For You” acknowledges past relationship immaturities and announces that things are different now. 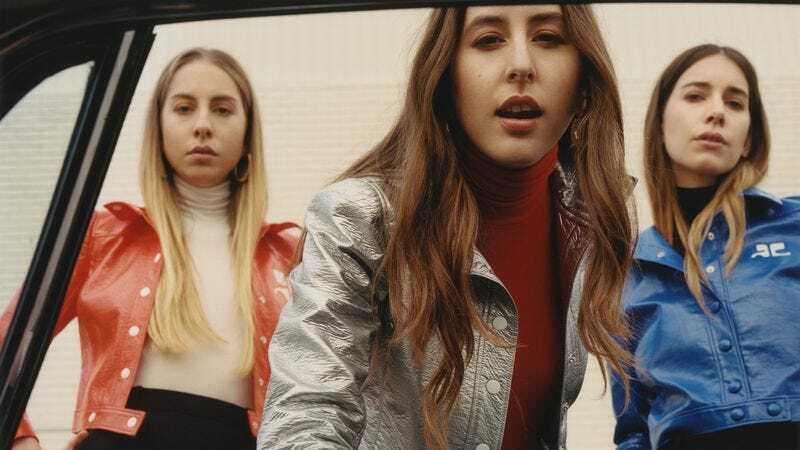 The Haim sisters’ genuine nature is a large part of the band’s appeal, especially because they exude enthusiasm without guile or calculation. “They [cross genre lines] so well, and I think it has a lot to do with who they are personally,” Lewis Jr. told Entertainment Weekly. “They don’t need to hide behind any façade. There are a lot of people who are posturing, and they just refuse to do that.” On Something To Tell You, HAIM’s innate sincerity and musical ambitions finally sync up, resulting in one of the more consistent, cohesive, and enjoyable records of the year. Purchase Something To Tell You here, which helps support The A.V. Club.